To continue in my quest for fabulous perfect nails it was time to banish the Tesco Value emery boards from my nail kit (yes really!) and invest in a nail file of quality. 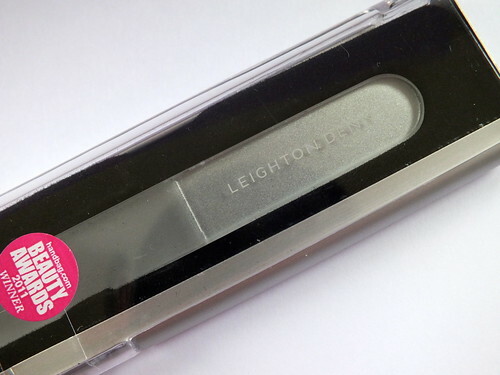 There was no other place to go than Leighton Denny and his 'Rolls Royce of nail files'. This nail file is truly amazing. I'm not the best at filing my nails and have to remind my self not to saw the nails but with this crystal gem you are able to use a sawing motion as the crystal literally turns your nail to dust. You only need one swipe to file off any edges it makes it so quick and I have to remember not to get too carried away filing before my nails disappear. Unlike glass files which will eventually wear down this crystal file will last far longer and just requires a run under water to clean. The one downside to this file is the back on edge sound that can sometimes occur not unlike nails down a chalkboard but I'm prepared to man up and put up with for all it's other qualities such as it's ability to seal the end of the nail to prevent splitting and peeling. I picked up my file from Boots and went for this smaller version in it's own case which is perfect for carrying around in my bag. No longer having the strength of acrylics I'm often snagging my nails but a quick file with this beauty and I'm good to go. These also make a great gift for friends and I know you might hate for me mentioning the Christmas word but it's the perfect accessory for anyone looking to take care of their nails if not one to add to your own list. Looks great, I have to try it sometime! Ooh, this sounds so luxurious! I need to start filing my nails more regularly. It sounds really good. I admit that I never really file my nails, I really should. What price are these? I keep meaning to get my hands on one. The smaller one looks nifty, especially in the casing, I'm forever scratching mirrors in my handbag just having them lying around. i keep hearing so many great things about this file! you have a lovely blog by the way, following!